Invite friends and family to celebrate the Feast of Gratitude & Gravy. This is a special weekend for families, singles, and couples. Imagine sitting around a blazing fire in the fireplace of the main lodge, surrounded by family and close friends you didn't even know you had. The aromas of roasting turkey, fresh-baked apple pie, homemade bread and hot apple cider fills the air, mingled with the faint aromatic fragrance of oak smoke from the fire place. This event can be thought of as “Hike in, EAT, hike out” event. However, there’s much more to Thanksgiving than just eating: there is fellowship, the beautiful ascent of the Santa Anita Canyon, probably a “talent show,” a wicked ping-pong match, some work projects—all of it sure to make you bang your cup on the table and holler, “Can I have some more please? !” Thanksgiving at Camp is, in many ways, like having a holiday with a family of 40+. There is cooking to do by many of the “family” members, there is clean-up by others, some will go out and gather wood for the fire, the kids play, the adults drink. So be ready for lots of participation. * Wednesday drop your personal items at Adams’ Pack Station by 7:30 am and then we hike into Camp and start cooking for both Wednesday dinner and Thanksgiving goodies. * Thursday is more cooking, playing, working and finally, the Feast mid-afternoon (4:00 pm). While still in a gravy-induced daze, we entertain each other Thursday evening while debating when to eat the pies versus starting the talent show versus lying down for a nap. All of these will be decided on site by those still able to speak intelligibly. * On Friday, there will general moaning about over-eating, sneaking in for pie for breakfast, farewell to the unfortunate few who must leave, continuation of the ping-pong tournament, short hikes, bird-watching, zip-line riding, etc. Or, (radical idea,) completely relax and do nothing. It is so hard to do, but so worthwhile! Thanksgiving is about sharing and caring for family and friends. One special tradition at Thanksgiving camp is the sharing of our talents and skills with others. Bring your talent for the talent show or lead an activity. So, please start thinking about what you can share with others to make this weekend even more special. Do you have a good game or art project? Would you like to lead a hike or yoga class? Can you lead songs at a campfire? Let’s make this loads of fun. Registration fee includes all food and drinks from mid-day Wednesday through Friday breakfast. 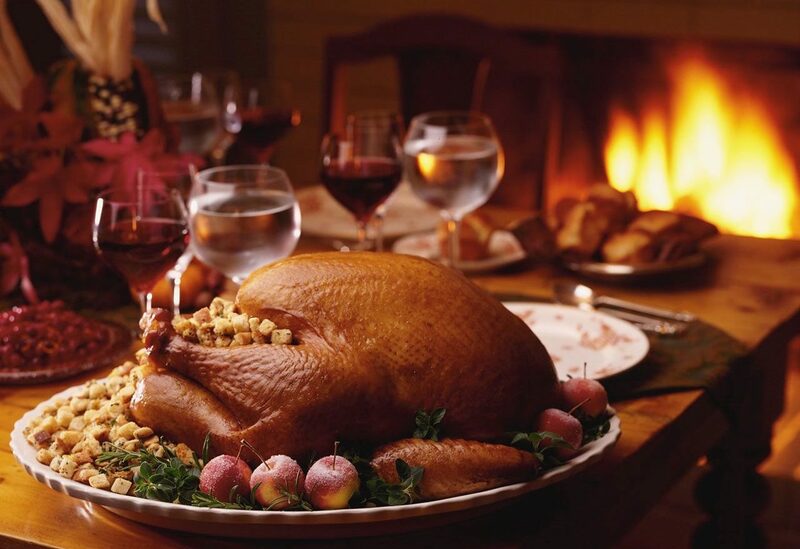 This, of course, includes a fantastic Thanksgiving meal, entertainment, and lots of fun. Also included is lodging for two nights, transportation via pack train of both your food and up to 15 pounds of your personal items. Such a deal!